A few weeks ago, we had some people over and everybody brought a little something to share. There was wine, punch, a platter of cheeses and a whole host of other tasty things. Somehow I managed to miss a carton of vanilla ice cream that was tucked away in the freezer. It did make for a very welcome surprise this past week when I was jonesing for a treat. Instead of eating ice cream cones, I decided to take things a step further. 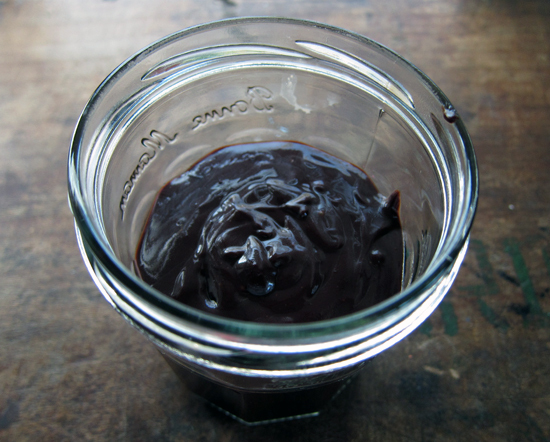 I made hot fudge sauce. 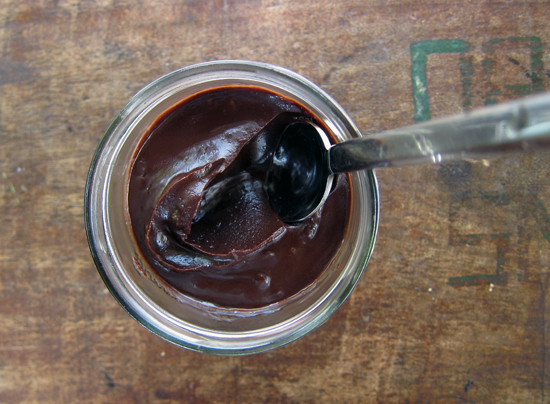 And not just any ol' sauce, but my most favourite hot fudge sauce of all time. Guys, this stuff is magical. Like, unicorns tip-toeing over rainbows in outer space kind of amazing. I first made this recipe years ago and it's simply perfect. But I always seem to play with my recipes and this time decided to make a vegan version with coconut oil and almond milk. It's quite alright to stick with the original recipe and use butter and whole milk (you can sub in whole milk for the cream and the results will still be delicious). Oh, and did I mention that it's really, really easy to make? Seriously. The only difficult thing here is deciding if you need help licking the spoon. The answer is, of course, no way. My husband would like to note that adding sliced bananas to your ice cream bowl makes the experience all the more worthwhile. I'm a purist but I do like to add a homemade cherry on top. Or you know, be a minimalist and eat with a spoon from the jar. In a small saucepan over medium heat, melt together the milk, coconut oil and sugar. Stir until melted. 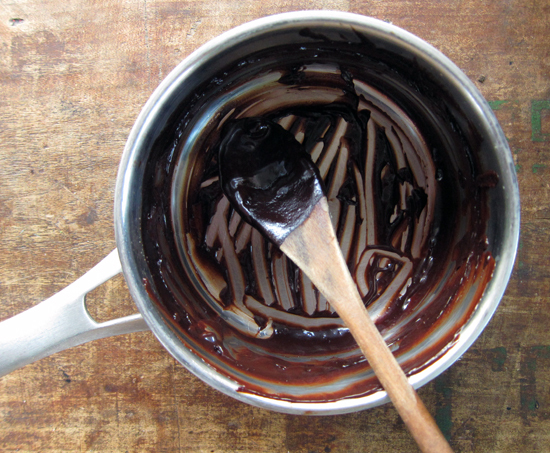 Turn down heat to a simmer and add in cocoa, peanut butter and salt and stir until smooth and glossy. If it's too thick, add in a bit more milk. Remove from heat immediately to prevent scorching. 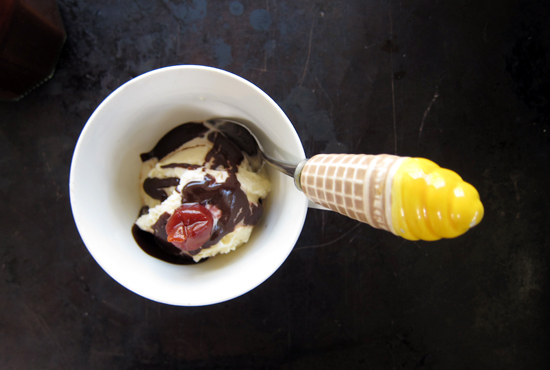 Spoon over ice cream. Spoon extras into a glass jar. Reheats well in the microwave (20 seconds should do it) or in a saucepan over low heat. What a great treat, shall be sure to try it. I love all those ingredients so much. Will try soonest. Oh yes, yes I will be making this. 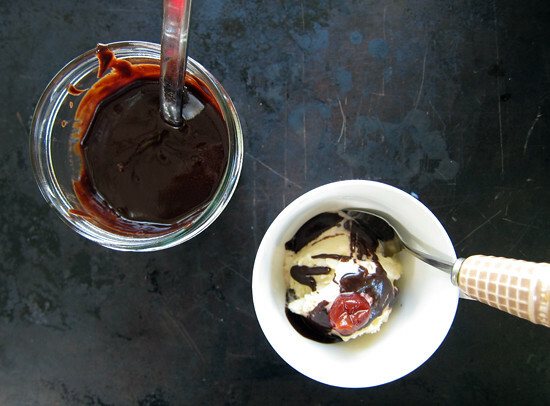 The last (and first) time I attempted hot fudge I was in France and accidentally bought sour cream instead of regular cream. I don't recommend it.